Anyone that follows this website knows that finding rare collectibles and marketing materials is top priority. So, when a poster from one of the most popular movies in the series pops up, we like to let everyone know about it! To some, this poster may be old hat as we are sure this has floated around the world wide web for many years, but for the scores of others, this will be quite a treat. 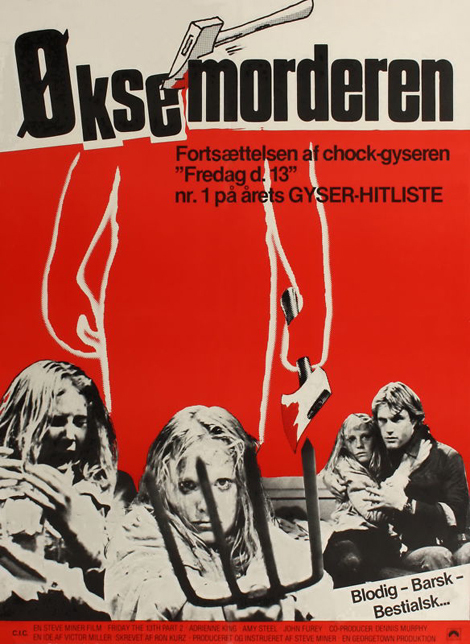 Below is the full Danish poster for Friday The 13th Part 2. It is quite simple, but the red background is indeed menacing, utilizing the silhouette of the killer more in the background and emphasizing the despair of Ginny and Paul. Using black and white photos from the film as additions to the poster gives it a more old school and nostalgic feel and would be a perfect one-sheet to hang on your wall. So, view the poster below and let us know what you think. Would this kind of design be acceptable to use in newer Friday the 13th movie posters as a sort of throw back approach?